Our Graphic Annunciator Panels and Smoke Control Panels are installed in many sites around the world. Please take the time to read about some of these interesting projects. The Louvre Abu Dhabi, is the United Arab Emirates new cultural superdome. Through an intergovernmental agreement signed on March 6, 2007, France and the United Arab Emirates decided to create Louvre Abu Dhabi, a singular and unique museum which will bring together the dynamism of Abu Dhabi and the values of excellence embodied by the Louvre name. Graphics National was awarded this prestigious project thru Tyco UAE. We custom fabricated 3 large Firefighter Smoke Control Annunciator panels. 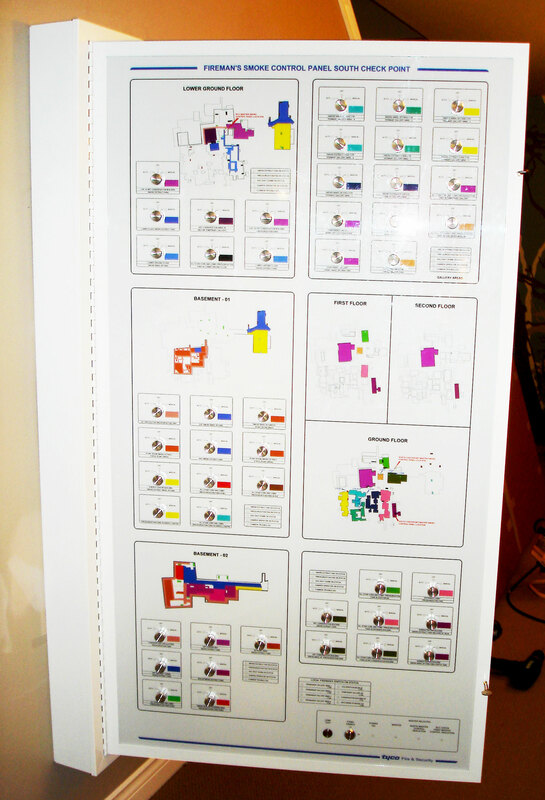 Color coded graphics were used to easily identify key smoke control areas. Each panel consisted of 47 smoke extraction HOA rotary switches and 178 status LED’s. The switches and LED’s were wired to Simplex 4100-7401 24 pt. lamp driver boards. Montreal's $2 billion super hospital is one of Canada's largest hospitals located in downtown Montreal. Graphics National was awarded a large contract to supply (2) Firefighters Smoke Control Stations (FSCS). The Smoke Panels were custom built to a size of 4' x 5'. Both panels consisted of (384) LED's, (128) HOA (3) position Rotary Switches & (1) Lamp Test switch. The switches & LED's were wired to Delta BACnet Building Controller modules eBX-04 & eBX-08 mounted in our extra deep back box. Graphics National built (3) large Fire Alarm LED Mimic Panels for the the Ministry of Interior building located in Doha, Qatar. The panels were our A-2436S series enclosure with (191) LED's, (1) Lamp Test Switch and wired to Potter DRV-50 driver modules. Doha is know for its futuristic skyscrapers inspired by ancient Islamic designs. The supergiant Burgan oilfield is an oil field situated in the desert of southeastern Kuwait. It is the worlds second largest oilfield. Graphics National built (3) Mimic Panels for its Burgan Head Office Complex. The 4100-4 unit Graphic Annunciator panels were designed to attached to the door of Simplex's 4100-4U enclosures. Each panel consisted of (39) LED's, (1) Lamp Lest Switch & (1) Silence Switch. The panels were wired to Simplex 4100-7401 driver cards. In September, 2007 work began on a $5.2 billion project to expand the Panama Canal. Now completed, the expansion project allows ships double the size of current Panamax to pass through the canal, dramatically increasing the amount of goods that can pass through the canal. Graphics National was commissioned to design and build 10 large Graphic Annunciator panels as part of a fence security system located at each lock. Home of the Toronto Maple Leafs and the Toronto Raptors. Graphics National was awarded the contract to build a large Fire Alarm Graphic Annunciator, Firefighters Smoke Control Panel and Passive Graphic for this iconic building. 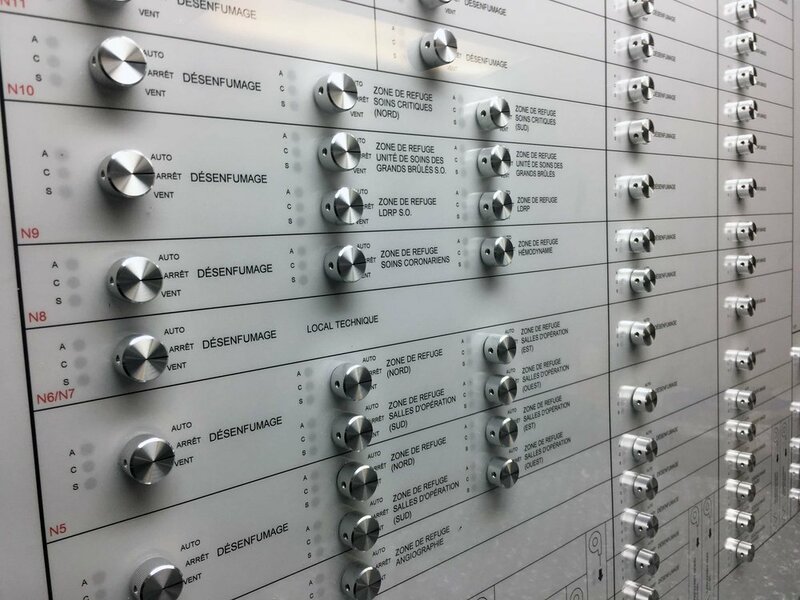 Located in the Fire Command Center, the Graphic Annunciator panel consists of 350 alarm LED's points and 30 control toggle switches. This $ 3.36 billion project supplies water and power to Jubail Industrial City and partially to the Eastern province cities in the kingdom. The plant is recognized as the largest power and water desalination facility in the world. Graphics National was contracted to supply 2 large Fire Alarm Mimic Panels. These panels were powered using Notifier LDM-32 Lamp Driver Modules. Home of the NHL's Pittsburgh Penguins. Graphics National built a large custom Graphic Annunciator 3'w x 5'h with 540 LED alarm points. The LED's were wired to Simplex 4100-7401 graphic driver modules. Graphics National is a principal supplier of Fire Alarm Mimic Panels for Saudi Electric Company (SEC) through out Saudi Arabia. Its Ultra High Voltage Projects (230 - 380) KV & High Voltage Projects (110 - 132) KV, typically will have (1) to (4) Mimic panels a each substation location. We use our A-1824S, A-2430S or A-2436S series aluminum enclosures to display the graphics. LED quantities range from (30) up to (220) per panel. The LED's are wired to Notifier LDM-32 & LDM-E32 driver cards supplied by us and installed at our factory.